Banking on our enriched industry experience, we are able to supply Wind Turbines Maintenance Services. To cater the varied demands of our valuable clients, we are providing Drive Turbines Turbomachinery Maintenance to clients. Offered services are imparted by adept professionals utilizing the best grade machines & advanced technology. A crew of skilled professionals executes these offered services in an excellent manner. Rushi Power Systems Pvt. Ltd.
With our expertise and trustworthiness, we are engaged in offering optimum quality Steam Turbine Overhauling Service. The provided service is executed by our dexterous professionals using superior grade tools and latest techniques. This overhauling service is rendered as per the variegated requirements of our respected clients. We are among the leading organization of the industry, actively involved in presenting a wide collection of Turbine Troubleshooting Services . Offered assortments of these services are rendered using modern technology. Offered services are highly demanded among the clients for their timely completion and budget friendly prices. All rotors are returned to their original and zero hour rated condition with minimal turnaround time. From our wide consignment, we are affianced in supplying Wind Turbine Maintenance Service.Regular maintenance of wind turbine can optimize its working conditions, extend its life span. Regular clean of wind turbine. 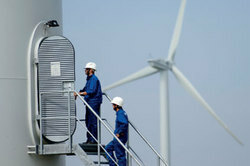 We are recommended by the clients for offering Wind Turbine Erection Service. The Wind Turbine Erection Service we offer is widely demanded by the clients. This service is available in various specifications according to clients' needs. Wind Turbine Erection Service is offered in market leading prices. Den Infrastructure India Pvt. Ltd.
We repair and refurbish the damaged turbine blades by our special team using quality approved material and rebuild to its exact profile. The method used is TIG welding. This specialised job is carried in a closed welding chamber which is free from moisture. These blades repaired as per ISO standard.